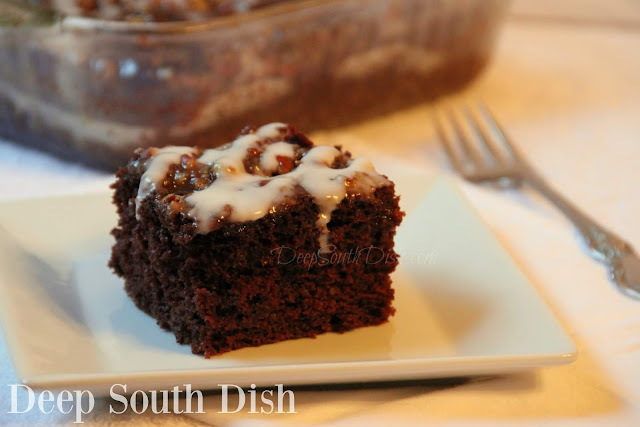 An easy, snack-sized chocolate cake, made with cocoa and chocolate chips and a smear of caramel sauce, poked into the warm cake, then finished with a powdered sugar icing drizzle. I'm not a huge sweets person. You've probably noticed that since there's a lot more savory, salty things on this recipe blog than there are sweets. Just like anybody else though, I love something sweet once in awhile and pretty much any kind of cake is right at the top of my list. Although I do have a few layer cakes I've done over the years, I'm really not a baker. Mostly they're not very pretty, though they're certainly tasty! The cakes I make most often are simple pan cakes, bundt cakes, or smaller, snack-sized versions, rather than tall, multi-layered cakes. I'm not a big fan of super sweet icings on any cake either, and the truth is, I usually scrape it off! I know. Kind of cake blasphemy isn't it? Most frostings are just too sweet to me. I patterned this cake after one I saw in a Betty Crocker mailer, though I chose to go with a scratch version rather than a boxed mix. I have zero objections to using boxed mixes, and in fact, many of my favorite cakes start with one, but I didn't have one in the pantry and it's easy enough to whip up one from scratch. Here's how to make this delicious snack cake. As always scroll on past the step by step pictures for the full recipe text, with measurements and a printable. Recipe is written for an 8 x 8 inch glass baking dish. For more of my favorite cakes, check out the collection on my Pinterest page! Preheat oven to 350 degrees F. Spray an 8 x 8 inch baking pan with Baker's Joy; set aside. Whisk together flour, sugar, baking soda, cocoa, cinnamon and salt in a large mixing bowl. Add oil, egg, buttermilk and vanilla and gently mix until batter is smooth. Pour into prepared pan. Sprinkle chocolate chips on top and gently press into batter. Scatter pecans on top. Bake at 350 degrees F for 30 to 35 minutes, or until a toothpick inserted near the center comes out with a few crumbs on it. Let cool in the pan on a rack for 30 minutes. Use a large tined fork or spray the tip of a round handled wooden spoon with non-stick spray and use the tip to poke the warm cake in one inch increments all over the top. Pour caramel topping evenly all over the top of the cake, using an offset spatula to carefully spread. Let cool completely. Prepare powdered sugar icing, adding additional milk if needed for desired consistency; drizzle over the top of the cake. Cook's Notes: May also sift powdered sugar on top or frost with your favorite icing once cake is fully cooled. Please remember cooking times are always a basic recommendation and estimate because all ovens bake differently. You must know how your own oven bakes and always adjust time accordingly. Measuring Flour for Baking: Whisk the flour container to aerate it, then use a spoon to spoon flour into dry measuring cup to overflowing. Use a knife or other straight edge to level off measuring cup. Scooping your measuring cup into compacted flour further compacts it meaning you use too much flour, resulting in a dense, dry cake because dry to wet ratios will be out of balance. Quick Homemade Caramel Sauce: In a medium sized saucepan, add 1/2 cup (1 stick) butter and melt over low heat. Stir in 1 cup light brown sugar, packed, 1/4 cup light corn syrup and 1/4 cup heavy whipping cream. Increase heat to medium high and bring to a boil; boil stirring constantly for 2 minutes. Remove from heat and set aside for 15 minutes before using, or store, covered in the refrigerator for about 1 week. the best recipes, makes me feel like I am in the kitchen with my mother and when we would visit her country aunts. I made the cho/carmel poke cake. when it was hot, it was delish, but once it cooled (the next morning). it was very dry on the bottom half. Not nearly enough toppings, I would double it if i make it again. Hi! The cake pictured is the cake I made from the recipe, and all of the step by step pictures as well. I can assure you that it was nowhere near "dry." If the bottom half of your cake was dry once it cooled, remember ovens bake from the bottom up, so it sounds like it was overcooked a bit. It's possible your oven was running hotter than the thermostat indicated. Always remember all ovens vary in how they cook so baking times will always be estimates. Always check at the lower end of the time in any recipe, even 5 minutes before if you don't know how your oven bakes. You want a little bit of crumb clinging to a toothpick when inserted into the center of the cake. As to the toppings, since its a simple snack cake it wasn't intended to be topping heavy. I can't attest to how it will turn out doubling the toppings, but keeping the pan the same size. Haven't done that.